Feb 4th: This giveaway is now closed. I will be picking a winner today and announce it on the blog tomorrow. Thank you all for entering and good luck. As promised earlier, I present you with my second blog giveaway! Once again, I wanted to thank you guys for taking time to check out Beautyspot. I started this blog about a year ago, hoping to document my daily makeup looks. As some of you know, I'm a mechanical engineer and hence work in a very male dominated field. I love and enjoy my career but this blog has given me an avenue to maintain my girlie side and be away from the boys a few minutes each day, hehe! I'm happy that you have found the blog helpful and hopefully, inspirational as well. Note: These products have all been purchased by me and I've been accumulating them for this exact purpose. To enter, you need to be a follower of this blog and leave me a comment stating "How did you find Beautyspot?" to get one entry. If you would like to increase your chances of winning, you can post a link to this contest on your blog. By doing so you will get an extra entry. Please remember to leave your email address in the comments so I have a way of contacting you. Also, if you have linked to this giveaway in your blog, please include the link in the comments. Good luck everyone! And thank you all again! 168 Responses to "100 Followers Blog Giveaway - CLOSED"
Hey Saadeh! :) So I found your blog through Specktra. I've always been a huge fan of your FOTDs and you're very consistent about updating your blog which is another thing I love. Good luck with the contest! I found BeautySpot though GOOGLE search.. I love Opi nailpolish, great give-away! I found you through Google Reader. I can't remember who suggested you but I found you through some of the other beauty blogs I read. when she posted about your giveaway today! I've just taken a look around and I will definitely be reading regularly from now on! I found BeautySpot by being "referred" here by you on the Temptalia forums. I think it was a mutual thing, lol. Thanks for this giveaway, my dear, and congrats on 100 followers! I found BeautySpot from Gildedangel at http://naive-nails.blogspot.com/. HI! I found your blog through Naive Nails' giveaways rundown post :) so I came here and really like your blog, plus you're giving away brands that I can't purchase where I live! so it's exciting! I found your blog on a post by Naive Nails. Hi! I found your blog from let's talk about beauty's blog! Hi!! I'm a new follower and I saw your blog in "Let's Talk About...Beauty" Blog. Then I decided to see it and.. I'm loving it. Hey girl, this is so cool! Well "How did you find Beautyspot?" mmm... I think we were posting in the Temptalia forum? Many of us started our blogs and announced it there. I think that's it, since I knew you first on Temptalia. *I have find you and your blog Beautyspot throught some other blog I read. I found your blog when looking for "New Makeup Looks" via Google! Been following ever since girl! Congratulations Saadeh! I didn't really find your blog... you have me the link and I love it! I found your blog my Google-ing a product and after checking out other post on your blog I decided I had to follow. I found your blog on http://lets-talk-about-beauty.blogspot.com/. I'm a google friend follower! I heard about this giveaway by blog stalking my friend (who has also entered (Fee)). I've blogged about this giveaway too!!! I found this blog following a Google search of makeup blogs. This led me to the 'international giveaways' blog post. I found you in FataAzzurra's blog! You can find me here http://panperfocaccia-grianne.blogspot.com/, come visit it if you want. Hi! 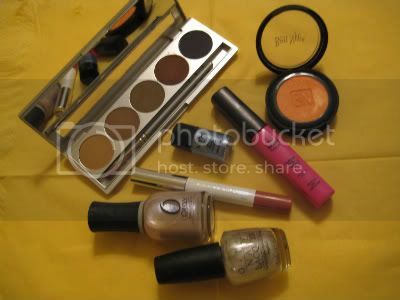 Very nice giveaway :) I love make up products.. I found your blog in Fata Azzurra's blog. Hi! I'm a new follower. I found your blog in http://xmaterialgirlsx.blogspot.com. Heyy! I found your blog at complete random I wish I could remember how :P I love your FOTDs i love that you consistently update which is awesome. Thanks for the contest! I'm now following you and looking forward to reading new posts! :) I found your blog through google blog search by searching for giveaways open internationally. Also btw, I'm happy to see that other people who follow my blog participated in the giveaway and are now following you. Best of luck! I found your blog through xMaterialGirlsx blog. "How did you find Beautyspot?
. I follow your blog! I found Beautyspot by being referred by a friend who mentioned this great giveaway. Hi there! Congrats on your 100+ followers! I follow your blog, my name is LouLou. This is an amazing giveaway! Thank you very much! I'm a new follower of your lovely blog! ♥ i found your blog via giveaway addiction blog.. I would like to enter your giveaway! I found your blog from rhaindropz and makeups blog. Great giveaway! I chanced upon your giveaway post when I saw it on Rhain's blog: http://hummysluvshubby.blogspot.com. I found you through a blog post saying you were having this contest. I heart about Beautyspot first when I was blogjumping a while back... I was going from link to link to read interesting stuff and stumbled upon your lovely blog! Hey :) congrats for your 100+ followers ! I found beautyspot thanks to Shan Shan Style blog ! I initially found you through the blog Contests and Such. Also, I am following your blog (username Nelsby). thanks for the giveaway. I randomly stumbled across your blog. I found you through Shan Shan Style's blog post about giveaways! I found you through the Naive Nails blog. Also, I am following your blog on Google Friend Connect (username Nelsby). I initially found your blog through the blog Contests and Such. I posted your giveaway on my blog: http://conbdebelleza.blogspot.com/2010/01/otra-nueva-tanda-de-sorteos.html (you can use the Google traductor button on the right to traduce it). I'd love to join your beautiful giveaway hehe..
Hi, I'm now a follower. I found you through Free 4 Beauty blog. I found Beautyspot while goggling for international giveaways. Hello! I found your blog in let's talk about beauty blog! great giveaway! I'm a new follower. I found your blog via international giveaways blog. But I will definitely be checking back! Lovely Giveaway! I hope I can win the prize!! I found your blog through google blog search by searching for giveaways open internationally. I'm a new follower - linked over from twitter! I'm not sure who's blog i was reading when i stumbled on your blog. Hi, i'm a new follower -- just found out about your blog through Shan Shan Style's blog! Woo! happy birthday for feb 5th. I found you blog a while ago, in another blog's roll, i think! Nice giveaway! Enter me, please. I'm a follower and I've found you through the blog Let's Talk About... Beauty. Hi very nice giveaway..I could no longer remember where i found your blog but i clicked your link from another beauty blogger as I love reading beauty blogs. "How did you find Beautyspot?" Following! Love the giveaway! Lots of brands I don't get here. I'm gonna quote Google in helping me find your blog! How i found the blog? Not from another site. I found it through my friend actually! Who has also joined this giveaway! Thanks so much for a cool giveaway dear! I fould you through Sparklecrack's blog! Hey, found your blog through a link from get gawjus page! and I don't know how I found you, it's been long. and i have a fish memory. hi, I came across your blog from international giveaways. Fantastic give away! I find your blog through google reader which i use heavily for following beauty bloggers. Well I do believe I found your blog from Temtalia...from posting FOTDs and random makeup talk and then we all jumped on the blog train!! I found your blog on google :) I was searching for reviews of the Spring Colour Forecast! Hi! I found your blog because of a post in "Con B de Belleza", Gabriela's blog. Your contest was linked from another beauty/makeup blog, can't remember which one. Hi, please enter me to this contest. I'm already a follower, i forgot where i saw your blog though.